Significant progress towards realizing a summit between U.S. President Donald Trump and North Korean leader Kim Jong Un has been made in multiple locations over the last 72 hours, U.S. Secretary of State Mike Pompeo said at a press conference on Thursday. The comments come after Pompeo met with Kim Yong Chol for the second time in two days in New York. Kim serves as vice-chairman of the Central Committee of the Workers’ Party of Korea (WPK) and director of the United Front Department of the WPK Central Committee. “In addition to my meeting with Vice-Chairman Kim Yong Chol, we have teams in Singapore at the DMZ working with their North Korea counterparts to prepare for President Trump and Chairman Kim’s expected summit in Singapore,” he said, adding that he was confident they were moving in the right direction. “We have made real progress in the last 72 hours towards setting the conditions…the conditions are putting President Trump and Chairman Kim Jong Un in a place where we think there will be real progress made from the two of them meeting,” he added. He was, however, unable to comment on whether or not the summit would take place in the short term. 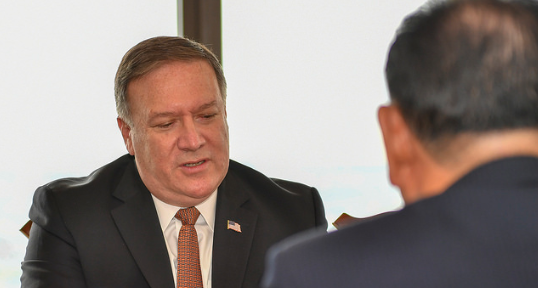 Pompeo again reiterated that he had conveyed the Trump administration’s position – in meetings with Kim Jong Un and more recently with Kim Yong Chol – which is achieving the complete, verifiable and irreversible denuclearization (CVID) of Korea. Though his exact language was the “Korean Peninsula”, which is more akin to North Korea’s messaging. If such a deal could be reached the U.S. envisions “a strong, connected and secure, prosperous North Korea that maintains its cultural heritage but is integrated into the community of nations,” Pompeo added. He also said that he has engaged in some “difficult conversations” with DPRK officials and that they have “given it right back” to him as well. Pompeo added that any resolution to be found between the U.S. and North Korea would not be straightforward but that both he and President Trump believe that Kim Jong Un has the ability to affect things positively. “It will take bold leadership from Chairman Kim Jong Un if we are able to seize this once in a lifetime opportunity to change the course for the world,” he said. “President Trump and I believe Chairman Kim is the kind of leader that can make those kinds of decisions and in the coming weeks and months we will have the opportunity to test whether or not this is the case,” he added. Pompeo also said if such an opportunity were not able to be acted on that it would be “nothing short of tragic” but that he believes it is being considered at the highest levels of North Korea’s Government. “I believe they are contemplating a path forward where they could make a strategic shift that their country has not been prepared to make before,” he said. “This will obviously be their decision…they will have to choose a path that is fundamentally different than the one their country has proceeded on for decades,” he added. Pompeo again confirmed that Kim Yong Chol will be traveling to Washington D.C. to hand deliver a personal letter to Trump from Kim Jong Un.